Super Hero Boy: A great place for Dylan to sleep while I work. A great place for Dylan to sleep while I work. The biggest problem I've had since my csection with Dylan is the constant bending over that you have to do when you have a new baby. Bouncy seats, swings, even diaper changes on the floor always render me a little tender by the end of the day. The first few days Connor spent most of his time napping in his bouncy seat but I quickly learned that getting up and down out of my chair constantly to check on him, feed him, change him, and all that bending over really took a toll on my stomach. Fisher Price's new Newborn Rock N Play Sleeper has been a real lifesaver! Super easy to assemble my husband had it ready to go within just a few moments, no tools required. Once its up you just push the very large easy to find easy fold buttons on the side to open the seat up and its ready to use. The seat itself its simular to a bouncy seat with a few very major differences. The seat is very deep making it suitable to be used for napping and sleeping while keeping baby very secure. As well, instead of being just a few inches off the ground the Newborn Rock N Play Sleeper is much higher than a standard rocker/bouncer as its a bit higher than seat of our couch so you can easily reach the baby without having to bend too far over from a sitting or standing position, perfect for all those csection mamas! Being tall also lends itself well to babies suffering from reflux, or babies like Dylan that have a ton of congestion, and need to sleep partially upright. You can easily move the rocker near the bed and use it as a cosleeper, or allow them to nap in it all the while keeping them close by so you can watch them. Personally I love the fact that I can put Dylan down for his nap near my computer chair and have some time to work but still be able to keep an eye on him and have access him without having to bend or stretch too much so not to aggravate my csection site. Though the rocker does not offer a vibrate or music option its base is set up to rock by "mom power" I keep my foot on it while I'm sitting and I can easily rock him if he gets fussy or starts to wake up too soon. You can see more features as well as watch a short demo for the Newborn Rock N Play Sleeper on the Fisher Price website as well as find a retailer near you that offers it! If your in a hurry you can pick one up for yourself at Amazon as well! 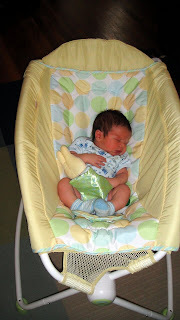 We received the Newborn Rock N Play Sleeper for free from Fisher Price to use in our review. Our opinions are always honest and built from our own experience with the products tested.